The Monsters and Mythical Creatures List contain the names of legendary beasts, monsters or massive animals that are based on the stories, myths and legends of the different tribes of Native American Indians that have been brought to life in their stories, dances, ceremonies and works of art. Refer to the article on Mythical Creatures for interesting information about this fascinating subject of Native American Mythology. 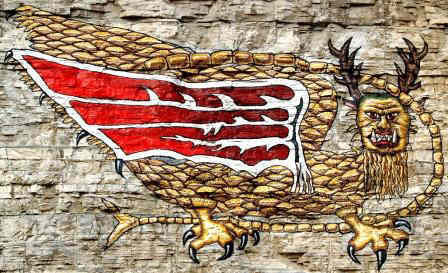 Zuni Bird The bird monster has celestial powers, and possesses feathers made of stone knives, which it throws at objects. The Monsters and Mythical Creatures List contains details of beasts and supernatural beings such as winged creatures, sea monsters, mythical humanoids and beings, flying creatures, water creatures, wolves, mythical animals, sea creatures, birds, dragons, dogs, winged monsters. These beasts all feature in the ancient stories, myths and legends of Native American tribes. Inuit Snake / Serpent Large snake-like water creature with a seven foot head and a tail with a flipper. Various tribes Giant Bird A large raptor-like bird usually with curling horns, long legs, a long beak and a featherless head. Head of a panther, snake-like tail and feet have the claws of a bird of prey. American Indian Mythology. Discover the vast selection of pictures which relate to the History and Culture of Native Americans. The pictures show the clothing, War Paint, weapons and decorations of various Native Indian tribes that can be used as a really useful educational history resource for kids and children of all ages. We have included pictures and videos to accompany the main topic of this section - American Indian Mythology. The videos enable fast access to the images, paintings and pictures together with information and many historical facts. All of the articles and pages can be accessed via the Native Indian Tribes Index - a great educational resource for kids.